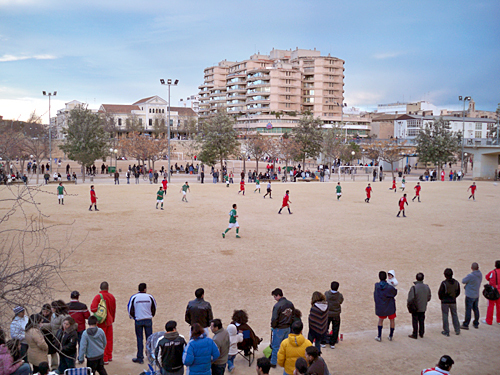 Sunday afternoons, the dusty soccer fields near the Torres de Serrano come alive with fast-paced matches between Valencia’s club teams. There’s a festival atmosphere to the whole thing. Often, up to 4 matches are being played simultaneously, and friends and family dot the sidelines with coolers of beer and food, usually paying more attention to their conversations than to their hardworking husbands or sons out on the field. 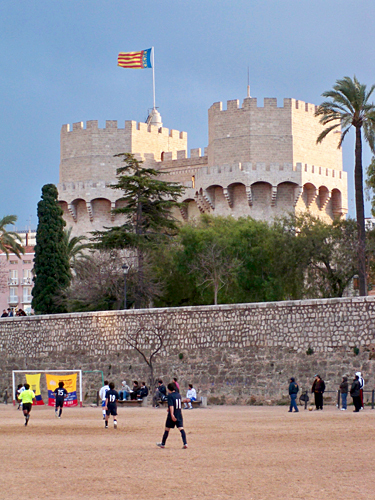 So if you’re a sports fan, and have been dragged away from the TV by your wife or partner for a Sunday stroll… suggest a walk through the Turia. This time, you win! That first image in that post reminds me…if you haven’t seen the movie “Goal: The Dream Begins”…you really should. Even though it has arguably the worst title I’ve ever seen for a movie, I actually really enjoyed it and thought it was pretty well made. Actually, I have seen that movie, just called “Goal!” in Europe. It was a lot better than we had been expecting… even Juergen liked it!